One of the biggest challenges faced by anyone reducing their bread intake is what to use in place of bread for such things as sandwiches, pizzas, even what to dunk into a hearty soup. It’s those occasions that can send us back to the bakery aisle for our old familiar fix. My first thought on this subject as someone who hasn’t eaten bread or pizza for many years, if I’m honest, is “get over it”. But I realise that isn’t too helpful when you’re just starting out! So I thought it was about time I experimented with a healthy alternative that could be used for such situations. It’s a tough call, because although the internet is full of recipes for gluten free breads, they still often involve a cocktail of ground grains that can irritate digestion, spike blood sugar and help our body hold on to fat. 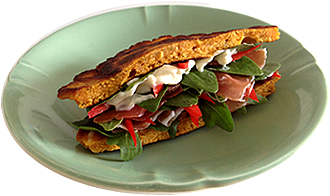 For this recipe I have used a small amount of chickpea flour – a nutritious choice as it is higher in protein and fibre. Combining it with sweet potato regulates the effect on blood sugar and makes for a very satisfying bite. Use this recipe to create large or small patties in various shapes to use for pizza bases, sandwiches, dunk in your favourite soup or dips or top with your fave savoury topping. I use a pre-baked sweet potato for this recipe. If you haven’t already discovered how versatile pre-baked sweet potatoes can be, make sure you sign up for my Free Recipe Series to receive a full cooking plan and more recipe ideas! Pop the flesh of the sweet potato out of its skin and into a bowl, mashing it with a fork until smooth. Add the flour, baking powder, Tbsp olive oil and egg to the bowl and mix thoroughly, seasoning with salt. Heat oil in a saute pan on a medium heat, enough to cover the bottom on the pan. Add spoonfuls of the batter to the pan, shaping with the back of the spoon to your required shape. Fry until slightly browned and set on the underside. Flip over and cook on the other side briefly. Remove to a plate with kitchen paper to absorb. You can store these in the fridge for 3 days or freeze them – they only take 30 minutes or so to defrost. 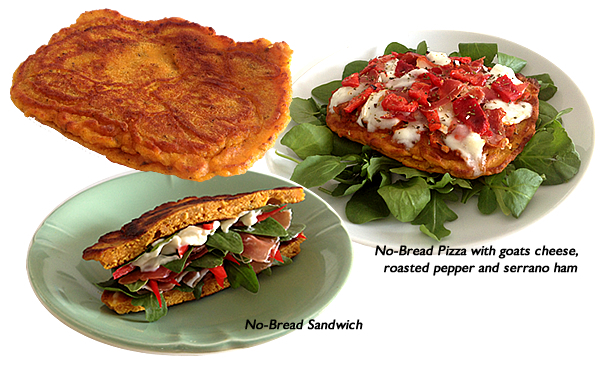 These are really versatile to have on hand for when you would usually grab a slice of bread!